Social media planning takes into consideration the target market and its unique biases and preferences. As part of the Integrated Marketing and Communications plan (IMC) a sound social media plan strives to connect with the customer in a seemingly passive way to allow for the illusion of organic connections, that continually fostered, breeds unquestioned brand loyalty. 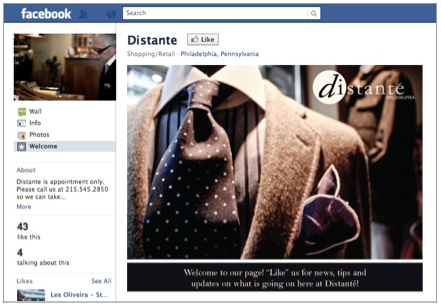 For this project I worked with social media maven and former student Migdalia Gonzalez *(check out her site here http://www.ohmydalia.com) to create a focused social media plan for Joan Shepp boutique located in center city Philadelphia. The intent was to first identify her online target audience via an online survey that asked target questions and supplied them with an incentive to fill out the form (in this case 20% OFF their next purchase). Once this information was analyzed the a social media plan was constructed to reach the Joan Shepp audience directly on their own terms. I worked closely with Joan's employees to help craft their own voice which best expressed the brand meaning within their identified market niche'. The following plan has been generated to act as a guideline for the possible creation of a social media presence online. It must be noted that special care must be taken to gradually build each of the chosen pieces carefully and purposefully and an internal action plan must be generated and supported to ensure a sustained effort will be successful. Joan Shepp has been a go-to staple of Philadelphia’s fashion since 1971. 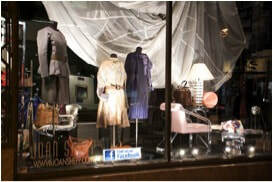 Offering a beautiful range of eclectic and simple fashion that are all truly one of a kind. Joan Shepp is huge on customer service and making clients feel like family is top priority. When considering social media, it is important to know who your online customers are and where to find them. 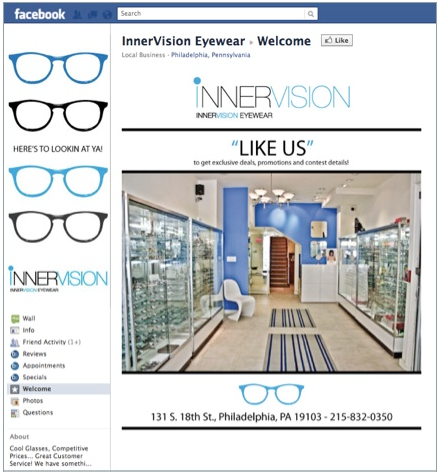 There are over 800 million users on Facebook. It is an undeniable marketing tool that will help with branding, promotions and sales. Joan Shepp currently has 714 fans on its Facebook page with sparring engagement. Building excitement about the brand through content and photography will be key in stirring more interaction between Joan Shepp and its fans and prospect customers. Create a welcome tab: Just like when a customer walks into your establishment and they are greeted by a smiling face, it is important to maintain the same atmosphere online. 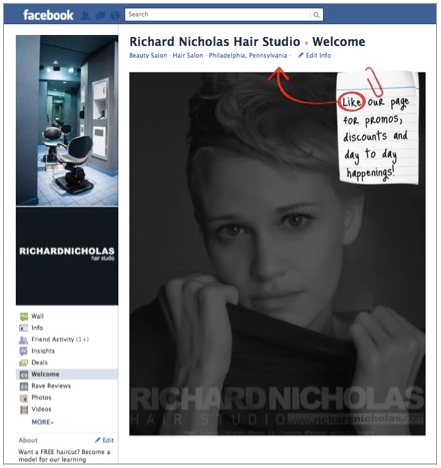 Creating a welcome tab will allow an online wanderer to land on your Facebook page and be welcomed. The welcome tab is your 1st impression to someone who may not be familiar with your brand so it is important to make it stand out and remain consistent with your brand. Creating content is the most difficult part of maintaining a Facebook page along with any other social efforts. It is important to be consistent and update daily. A content calendar promotes organization and consistency on a page, along with making it easy for everyone working on the page to know what information is going on the page and when. Content on a Facebook page needs to be engaging and conversational. Asking questions and sharing photographs work best with Facebook fans and really creating strong call to actions in order to improve a page’s edge rank. 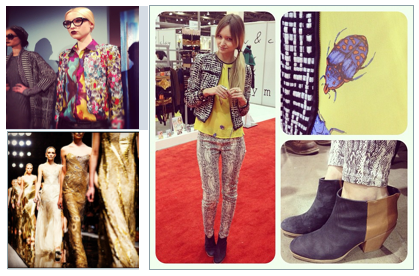 In the fashion industry, Twitter and blogs are always on top as favorite platforms. Twitter let’s you send out bits of information is quick, yet still informative messages. Twitter is known as a micro-blog, which means taking the current information, news or event you’d like to share and shorten it so that it can be distributed quickly among many media channels. Joan Shepp has a solid following, so it’s important to continue to make short and sweet posts that will intrigue fashionistas, prospect clients and bloggers. Short posts with photographs and information about what’s going on in-store along with, links to new merchandise, blog posts and any Facebook specials are all good things to tweet about daily. When reaching out to bloggers it is important to do research and find out which bloggers fit your customer profile. Usually when it comes to blogger outreach, it is very important to know what they like and what brands and products they like to wear. Well known fashion bloggers have millions of views a week, if not a day. To have a product you sell be featured on a well-read blog will lead to items being sold out instantly, especially if the product resonates with that blogs readers. Be sure to let your in-store clients know that you are on Twitter! It is important to give them value- Why should they follow you? Will you give 1st looks to new merchandise? Will they be able to have a say in the design of the next store window? Even if it’s not monetary, value is key. These photo/inspiration sharing platforms are a heavenly match for any retailer, especially one who carries high end and stunning pieces. The above images are photos by top fashion blogger during NYFW- Designers, brands, bloggers and everyday users flock to Instagram in order to take quick photos, add professional filters and share them with the world. This would be a great tool to help take quick photos of new merchandise, a new window, what your stylish employees look like on any given day or just anything that happens on a regular day in the shop. It may seem mundane, but people really respond to seeing brands from the inside out and they make an emotional and personal connection to your posts, photos and updates that you share. * If you add your own “pins” you can attach your website to it, so if people like a particular dress, they may click the photo, be taken to your site and potentially purchase. A blog is a fundamental part to a website. People want to know what’s going on in the store, on the runway and all things “Joan Shepp”. Creating an editorial calendar for the blog (and all social efforts) will help keep ideas organized and content consistent and cohesive with the brand. An actual blog that is hosted on your own site helps allow users to shop on your site and then continue to stay on your site to learn more about fashion, trends, styling tips and whatever else you’d like to use that space for. It is important to have readers come back to the blog daily and for them to know what to expect on certain days. Monday Blog Post: Product of the day- Feature any of the items in your shop (preferably one that can be purchased online) and take a photo (using Instagram, helps with consistency) talk about the item, why you like it. Tuesday Blog Post: Inspiration of the day- Maybe you’ve been using Pinterest and have found some really great images you’d like to share with your blog readers, compile them all together and write a quick paragraph on why those images are inspiring. Wednesday Blog Post- Staff Style. Simply post an image of one of the employees and something that they are wearing, or their entire outfit. Items don’t necessarily need to be from Joan Shepp. This helps the reader make a connection to the store and want to come back and learn more about the people of Joan Shepp. Thursday Blog Post- Celebrity Style: Feature a celebrity or model who you feel represents your brand, and talk about what they’re wearing and why you love it. Note: These are just ideas and you certainly do not have to update the blog everyday at first, but keep in mind that it is very important to keep a schedule and follow it. So whether you decide to do 3 updates a week or 7, be sure to keep it consistent. Creating this content is also helpful because you can later share it on your Facebook page and Twitter to let people know that a new post is up! Inspire your users and keep them interested in what you have to say. Know your voice. Use it. You are not a robot. People respond to personal messages, emotion, and excitement. Use them all. Be where your readers are. Do they read one specific blog everyday? 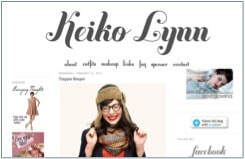 Then try sponsoring or partnerships with the blog. Want new customers? Google & Facebook ads are inexpensive and easy! Have two employees reassigned to be your “social media” managers. This will be their sole full time responsibility moving forward. They will need to work together to support each other. Allow for one other employee to work with both of them 1 full day a week on generating and editing content. Acquire part time or full time graphic design and photography intern from Art Institute (or other institution) for additional graphics support and ideas for visual content. Employee # one's focus is on generating ideas for verbal content as well as the content itself, social media verbal content management, and issuing weekly calendar of activities for social media efforts for Joan’s approval. Employee # two's focus is on creating and managing visual content (graphic and photographic) in support of social media efforts. Cross-train all 3 employees on graphics management and creation and use of social media by sending them for further education. Employees will present their ideas (day to be determined, preferable Monday) and focus for cross platform social media content at weekly all staff meeting for discussion and final approval from Joan to be implemented the following week. Which platform to use is an important question to answer as it may help determine future issues regarding integration and / or migration to a larger extended site. The recommended platform for this initial effort is Word Press as it is readily scalable to and e-commerce configuration if needed and is also currently the preferred blogging platform. It should be noted, as with many template driven platforms, the overall design themes are already established and as such are limiting in some respects. Though they can be modified by a professional programmer if need be, the objective at this point is to maintain simplicity of work flow and content management until such time the internal infrastructure of Joan Shepp allows for a larger more in-depth effort. Once the blog has been established and is up and running you will need to contact your web site administrator and have them reflect your current URL (web address) to your blog so as to maintain continuity for customers who have used your site thus far. Social media plans need to be promoted maintained and nurtured. They need to maintain a tangible connection to your audience. All facets of your business must directly or indirectly support and further the “social” aspects of your company. The following are some initial ideas that help remind customers of your connection. As noted in the introduction of this plan the current state of the infrastructure of Joan Shepp has several challenges to address. By starting on a smaller scale it is hoped that the ongoing internal need to plan, generate, manage, share verbal and visual content can be mastered and serve as the initial starting point for possible future plans and goals.